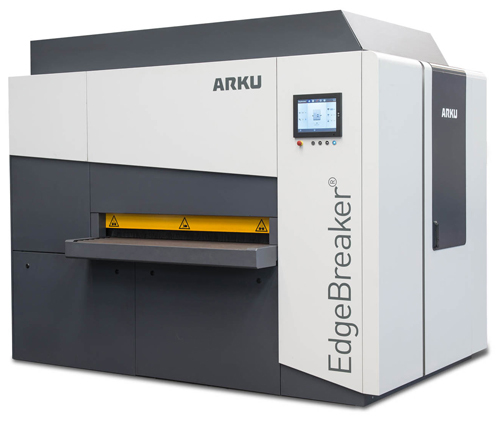 “From our many years of experience in leveling technology, we know that flatness results are improved when fabricators start with a clean, burr-free part,” adds Franck Hirschmann, Arku key account sales manager. Use the EdgeBreaker on a host of materials, including aluminum, steel or titanium. The Edgebreaker is a dry-processing application and can perform double-sided deburring and rounding. Its oscillating roller removes unwanted burrs, while transverse-running rounding units equipped with rounding locks simultaneously round the edges on both sides. A patent-pending one-click system allows for quick replacement of the rounding blocks. Part-parameter input is quick and simple using touchscreen controls.